When I delivered my daughter (at the hospital where I currently work) in addition to the usual diaper bag with pacifiers, diapers, onesies and blankets... I was sent home with a book, I called it my baby bible..and loved having it around since she was my first child.. it was several hundrend pages long and had detailed info on baby-infant-child development, ages 0-5yrs... My daughter will be five this year and I still use it as a reference... I use(d) it more than anything else I was sent home with.. I used Kaplan and passed NCLEx the first time, 75 questions... Kaplan focuses on test-taking strategies mainly... after my Kaplan course, I took a few weeks to review content (from Kaplan's content review book and my HESI review book) and answered 100s of questions (I only did questions from their Qbank, it helped a lot)... Its true that their decision tree doesn't work on EVERY question you come across (they give you tips/strategies for most types of questions), I think I may have only used it 20 or so times during my NCLEx, but what I did get from Kaplan, and what I believe saved my tail, was learning how to slow down and dissect each question... how to break the question down, determine what's being asked and choose the best answer. I don't think I would've done so well on NCLEx without Kaplan... but Idk if that's due to Kaplan teaching me what I needed to know, or if taking the course gave me the confidence to go in there and do my best... I don't know.. but if I had to do it again, I'd use Kaplan again... just my opinion..
Are positions available for a RN with an associate's degree work ob/gyn? How long after graduation did you wait before taking the NCLEX? I graduated Feb 2012, took a Kaplan course mid-March.. got my ATT late March/early April, scheduled NCLEx April 18th then rescheduled to May 8th giving me a few more weeks to review. A lot of people told me not to reschedule my NCLEx but I didn't want to take it until I felt CONFIDENT to sit for it. I took it at 8am May 8th and passed in 75 questions. I don't regret moving my test date at all. I took it when I felt confident and ready. A lot of people expressed interest on your other post about this... Summertime is here!! Do you have anything set up yet?? I'm sure your daughter graduated already (Congrats to her btw!!)... but I just graduated and got some great gifts, thought I'd share in case anyone reads this thread looking for ideas... They were very "nursey" which I loved because it made me feel "official"... My older sis, who's an RN got me a gift basket filled with things I'll need on the floor: penlight, watch, pens (lots and lots of pens), dry erase makers, scissors, etc, and a fanny pack to put it all in... she also got me a pair of white nursing shoes (haven't tested them out yet) and the best part of the package was the Littmann Master Cardiology Steth, gold and black with my name engraved on it including "RN"... One of the best gifts I've ever received.. I cannot wait to use.. everything!!! Oh and I got several gift cards to Starbucks and Dunkin Donuts for use during NCLEx prep.. those cards DEFINITELY came in handy!! An NCLEx prep course (like Kaplan) would also be a great gift... most new grads probably can't afford the course but would really benefit from it.. Thank you.. and I'll be working in Mother/Baby!!! How did you *know* your specialty and when? ADN...is it worth the time? what if you already have a B.S? 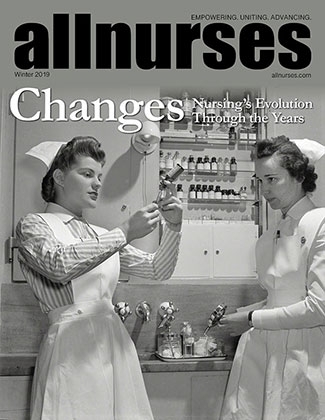 What jobs did you do before nursing? I got a job!!!! BOO-YOW!